A place where family and friends can get updates about my sweeties and hopefully be inspired by my creations. While we were in West Virginia we had a family birthday party for Cassie. We had a cookout at my parents house. Thanks goodness we had great weather because we had about 20 family members there. I used a Pooh theme for Cassie as Pooh is the only character she recognizes. She says "pooh pooh". So cute!! Here is Kevin (on the right) with his brother Brian. Brian's girlfriend Jody and her son Cody. My 92 year old Great Aunt Izzy and my soon to be 80 year old Grandma, Betty. They don't look it, do they? What a lucky girl I am. My Dad, Fred and Aunt Izzy. Sorry Dad for getting you while you had your mouth full. From the left is Kevin's Mom, Donna, my brother, Anthony and his friend Jamie. Sitting next to Kevin is his step Mom Kathy, his Dad, Vince and then my Mom, Melanie. Behind Vince and Kathy is Tyler, Kevin's half brother. I forgot to post a picture of Kevin's step Dad, Mike and my sister, Michelle. Sorry guys, I will post pics of you both on next post. Actually I don't think I have a picture of Michelle at the party but I have some funny ones I will show you. Michelle did play photographer for me though. Thanks Michelle!! Love ya both!! Cassie was great during the whole party. I was like she knew it was for her. Here we are singing Happy Birthday to her and she putting her head down like she was embarrassed but she was smiling. It was sooo cute!! Here she is trying so hard to blow out those candles and she did!! Yeah!!! It was so funny though, as she was trying to get a cupcake she was getting icing on her figures and she did not like it. At her first birthday she jumped right it with both hands. What a change. She had a great time opening her presents too. See picture below. Aundrea gave her this baby bottle and Cassie fed everything she got with it including the cards. Yes, I would show her the cards and point out the animals or whatever was on them and she would feed them with the bottle. I had downloaded the picture of it but for some reason it is not here. It was so cute. She is such a good mommy!!! I just love her facial expressions. Thanks for checking in. Have a great day. It was a fun time, especially seeing the expression on Cassie's face when she blew out the candles! In a word Priceless! Thanks for sharing the pictures of Cassie's birthday. Wish I could have been there to see it! It looks like all your family was there. I'm a SAHM who has been blessed with the sweetest cupcakes ever, Aundrea (6 years) and Cassie (2 years). 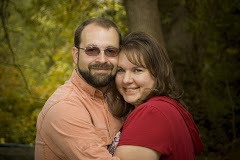 I also have been blessed to be married for 13 years to the most wonderful husband in the world, Kevin. There is nothing that he would not do for us and for that I thank God. I love to spend family time with Kevin and the girls. When I get any spare time to myself, I love to scrapbook and stampin up. Hit Me With Your Best Shot!! !